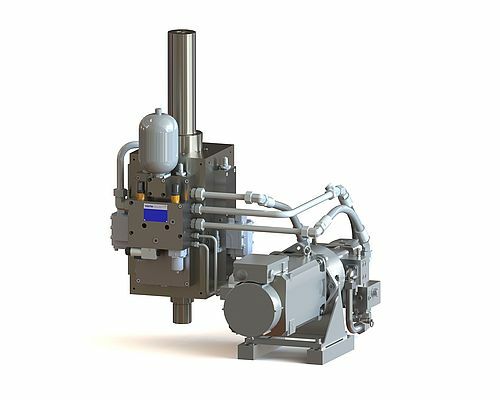 Voith presented its dynamic offering in terms of efficient hydraulic systems for sheet-metal processing such as the PDSC (Press Drive Self Contained), HDE High-Performance Punch System, the PSH Press Drive, and the CLDP Servo Drive. The Voith PDSC hydraulic linear drive combines high power density capacity, energy efficient automatic gear shifts, wear free operation and precise force and position control. The simple and compact drive comes without classic valves and has integrated control technology. The unit has few electrical interfaces and does not need a hydraulic power pack. Significant advantages for operators include overload protection, high power density, virtually wear-free operation, significant energy savings as well as unlimited programmability. This confirms that this drive is a highly dynamic, efficient and compact unit which delivers extraordinary productivity for end users. Maintenance is recommended every three years, or approximately every twenty thousand operating hours. Voith punch systems can be installed in entry level to high-end machines. The HDE is a special system for high performance punching, nibbling and forming applications.